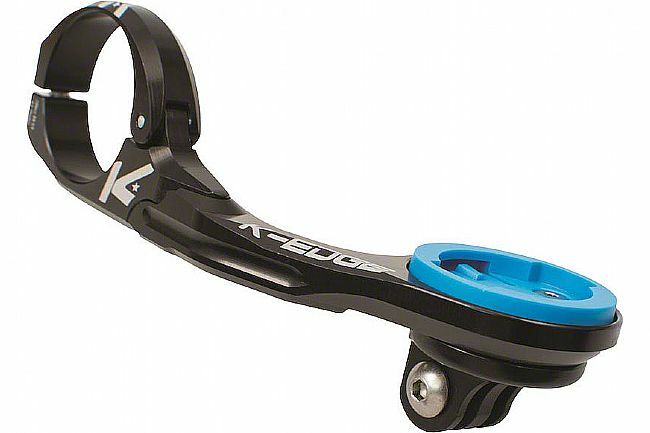 The K-Edge Wahoo Combo Mount is the next generation of industry-leading Wahoo Computer Mounts – stronger, easier, more versatile, and more stylish design to compliment your Wahoo and your bike. The ultimate upgrade for your Wahoo computer. CNC Machined 6061-T6 Aluminum Platform, Injection Molded Garmin Specific Co- Polymer. I bought this for my elemnt bolt, but realized it was for the larger one, (my mistake). Still looks great and works with my cateye sync headlight with the purchase of an adapter. I got this to replace the outfront mount which came with my Wahoo Elment to add the GoPro style mount. It is a very nice mount, easy to install, fits perfectly, and looks great. The top holds the Elment just like the original mount did. Since it is aluminum it is more solid than the plastic one was but it does not feel much heavier than the plastic one which worked well. I am using the GoPro mount option for my PowerPod which holds it perfectly, and in a better position in front of my shift cables. The GoPro mount would also be perfect for a front light, besides a GoPro camera. And it is made in Boise, ID.